Of special interest is The Club at Dunes West’s expansive new athletic clubhouse, located on Harpers Ferry Way just behind the gate. The clubhouse includes a state-of-the-art fitness center that features machine and free-weight equipment, an aerobics room where weekly classes are offered and meeting rooms ideal for everything from entertaining small groups to hosting large neighborhood get-togethers. 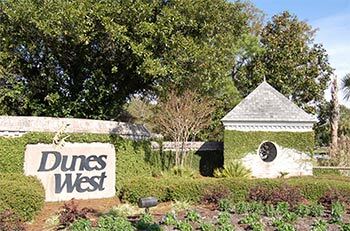 Dunes West’s full-time activities director, Meg Keally, coordinates a busy schedule of events and activities for club members — everything from holiday parties for the entire family to karate, yoga, dance and aerobic classes. And, of course, tennis enthusiasts love the club’s nine lighted courts—six asphalt and three clay—complemented by viewing pavilions and a pro shop. The tennis center, managed by Director of Tennis Jack Miller, is a veritable hub of activity for all ages, with a variety of programs available, including camps, league play, group clinics and private lessons for all ages.